It's basically the law that if you see bananas starting to brown on your kitchen counter, they must make their way into a banana bread. Which is why I always keep baking supplies on hand, for just such an emergency. There is always unsalted butter in the fridge, flour and sugar in the cupboard and, thankfully, a plethora of cookbooks to choose from when just such a situation arises. It is one of my favourite things about my kitchen, really, that deliciousness can be coaxed from it at the drop of a hat. I get a bit feverish if I am running low on flour, so if anything I'm over-prepared. Paul is on board because it fits with his ideas about preparing for a zombie apocalypse. 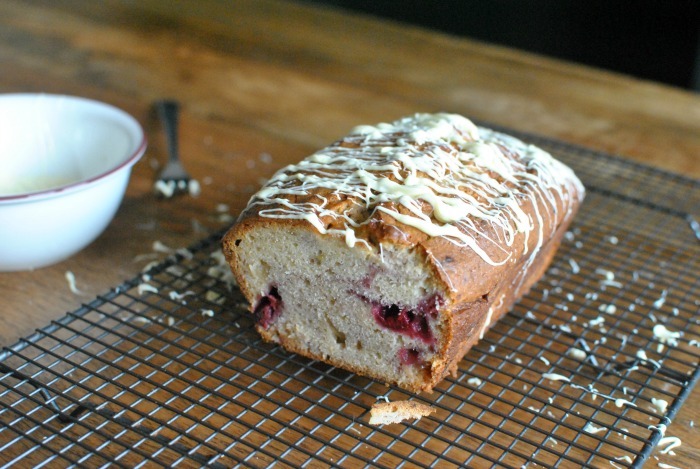 Either way, this banana bread was whipped up with nary an hour to spare with friends on their way round and the dregs of browning bananas, frozen raspberries and leftover chunks of white chocolate from making freezer cookies. Obviously, I would recommend that you make this bread faithful to the recipe, as it proved a rather lovely breakfast the next day, but really, banana bread is very forgiving and will take anything you've got lurking in the cupboards - so I want to encourage you to experiment. Dark chocolate and a splash or rum or bourbon would be delightful. As would chunks of fudge or swirls of salted caramel, or the addition of some browned butter. Blueberries are the natural bestie of banana, whilst some carrot and sultanas would make a nice carrot-cake-banana-bread crossover. Do what you feel, my friends. Preheat the oven to 180C and prepare a loaf tin by greasing with butter. Sift together the flour, salt and baking powder and set aside. Using an electric mixer (if you have one - it can be done by hand but it's a lot more work!) cream together the butter and sugar until light and fluffy. Add the eggs one at a time, beating well between, before scraping down the sides and mixing in the banana. With the mixer on low, add the flour mixture and stir until just incorporated. Fold in the raspberries and white chocolate. Pour into the prepared tin and bake for 55 minutes - 1 hour, until a skewer inserted at the thickest part comes out clean. Leave to cool and decorate, if required, by melting some white chocolate in 30 second blasts in the microwave until smooth, and using the tines of a fork to flick the melted chocolate over the top of your loaf until you get the desired effect. Serve in thick slices.